SHETLAND’s most outlying communities which currently suffer from poor or no broadband service may soon be enjoying higher download speeds than many urban areas. The Northern Isles digital forum, held in the Lerwick Town Hall on Thursday, heard from a number of key industry representatives including Duncan Nisbet of the Scottish Government’s R100 programme which aims to bring superfast broadband to all households by the end of 2021. Nisbet said around 4,400 premises in Shetland, households and businesses, are set to benefit form the programme that is currently at the procurement stage. The Scottish Government has earmarked £600 million in public money for the 100 per cent broadband rollout. £384 million of that will go towards northern regions including Shetland, once contracts have been awarded later this year. “We’ve got three bidders at the moment, and all three have suggested to us that they expect the majority of the deployment to be full fibre which will, hopefully, therefore deliver certainly ultrafast speeds which, in theory, means that some of our hardest to reach places may end up with better infrastructure than our urban areas,” Nisbet said. The R100 programme is expected to supersede many of the ongoing programmes to improve broadband coverage across the islands and in particular to those outlying areas which have been fallen behind in recent years. 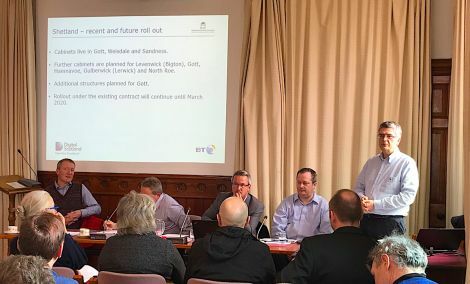 Mark Dames of BT Scotland told the meeting that the company was working on upgrading 17 remaining rural telephone exchanges to ASDL 2+ standards in Shetland over the next two years. This upgrade will bring improvements to the download speeds to those living less than four kilometres from their exchange and have not benefitted from the joint £146 million programme by Highlands and Islands Enterprise (HIE), BT and the Scottish Government which has given 70 per cent of premises in Shetland access to superfast broadband of at least 30Mbps. HIE’s digital director Stuart Robertson said new cabinets in Gott, Weisdale and Sandness were now live and further equipment would be installed in Levenwick, Gott, Hamnavoe, Gulberwick and North Roe to improve services. But this work was never intended to cover 100 per cent of the isles, as the approach was to extend coverage from the centres of population to reach as many people as possible. Hosted by local MSP Tavish Scott, and attended by around 30 people, the digital forum also heard from Simon Miller of mobile provider O2, who gave an update his company’s work in Shetland. While more needed to be done, he said, significant progress in improving mobile phone coverage had been made. Over the last two years O2’s 4G coverage has increased from 27 per cent to 72 per cent thanks to upgrading existing masts but also installing new ones at Holmsgarth, Scatsta and Hamnavoe. He expressed confidence that further improvements to 4G coverage could be made should all providers sign up to the idea of a single rural network. Referring to the R100 programme Scott said: “A lot of issues are yet to be resolved but at least the right approach is being taken, which is starting from the outside working in and therefore solving real gaps in the network notably in the North Isles, Wester Skeld and Reawick. “I think there is no question that we will move towards fibre to the premises all over the country and the hope will be that Shetland might lead in a little part of that.